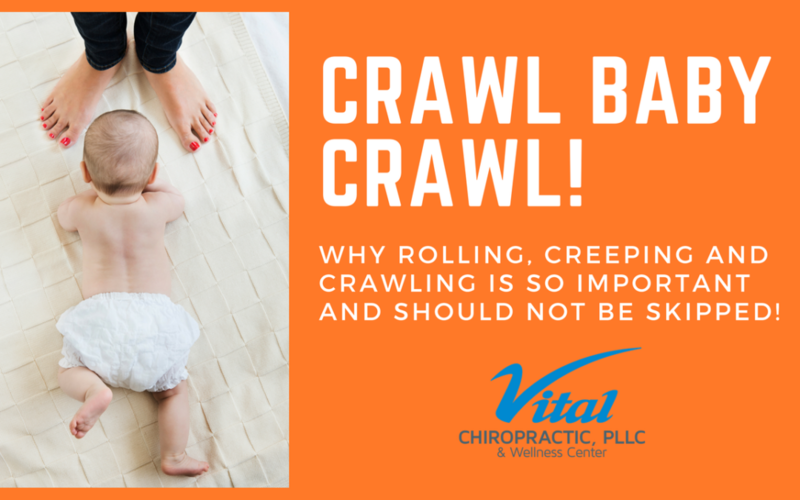 Did you know how important rolling, creeping and crawling is for babies? They are essential milestones for proper neurological development and spinal development. Don’t get in a rush to have your baby walk! If they don’t go through these milestones it can cause problems down the road. Here I have a short video about the importance of crawling! My first son was more of an “army crawler” than a traditional crawler. Is that a problem? He did crawl normally, but literally only for a few weeks before he started walking. I am mainly asking because my 2nd son is now doing the same thing…propelling himself around but not getting his belly off the floor and actually crawling. He may still (he is not quite 8 months) but I figured I should ask in case there is something I should be doing to encourage his crawling before he skips to walking if he follows his brother’s footsteps. 🙂 Baby #2 did roll over at 10 weeks,and seemed to have no trouble with that. Great question! All babies should “army” crawl before they crawl on hands and knees. It is important that they do both. If they do not want to get on their knees in a reasonable amount of time, it’s a great time to have them assessed by a chiropractor who focuses on infants and children. It’s hard to say if they have an issue without an assessment. It never hurts them to get checked!